Happy Make Your Bed Day! 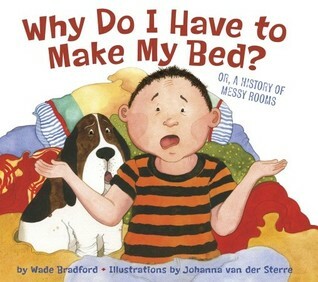 When a grumpy boy asks the question, ‘Why do I have to make my bed?’ his mother replies with a history of children who have asked the same question. His grandmother asked the same question after she had already washed and dried the dishes, dusted her rock’n’roll records, and picked up her slinky, hula-hoops, and roller skates. Her grandfather asked the same question after he had fetched water from the pump, dusted the phonograph, and picked up his spinning tops, toy train, and tin soldiers. His great-grandmother asked the same question. Her great-great grandfather asked the same question. And back, and back, and back… through the pioneer days, colonial America, voyages to the New World, in the Middle Ages, the Age of the Vikings, the Roman Empire, Ancient Egypt, and all the way back to prehistoric times when the cave boy who asked the same question after he had already hunted mammoth, dusted the stalagmites, and made the fire. Why? Why? Why? And the cave-mother just stared at him and said, ‘Because I said so.’ And so all through history, the children just said, ‘Oh,’ and made their beds. Whether you stay up late or sleep in today, you’ll still have to make your bed. 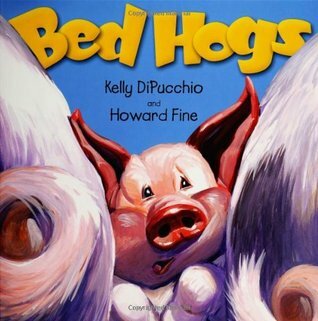 But before you do, enjoy these funny picture books about going to bed. Momma and Poppa were sleeping in the bed when Evie, who was frightened by the storm, bounced in their bed. 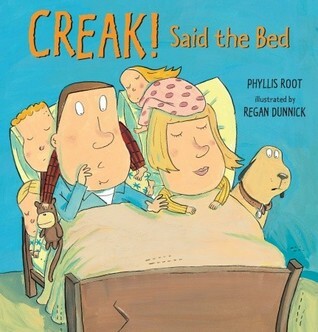 And the bed said, Creak. Soon Ivy joined them and the bed said, Creak. Not long afterwards, Mo climbed in with them and the bed said Creak. The whole family was snoozing when the thunder crashed sending their dog Fred in the bed, and the bed said CRACK. The bed collapses under the sleeping family. And the floor said, Creak.